Apart from cơm (white rice), bánh mì (Vietnamese bread) and gỏi cuốn (spring rolls), what else do you know about Vietnamese cuisine? Here are 23 of my favorite dishes that I crave every single day, from simple street food to elaborate dishes prepared during traditional occasions. 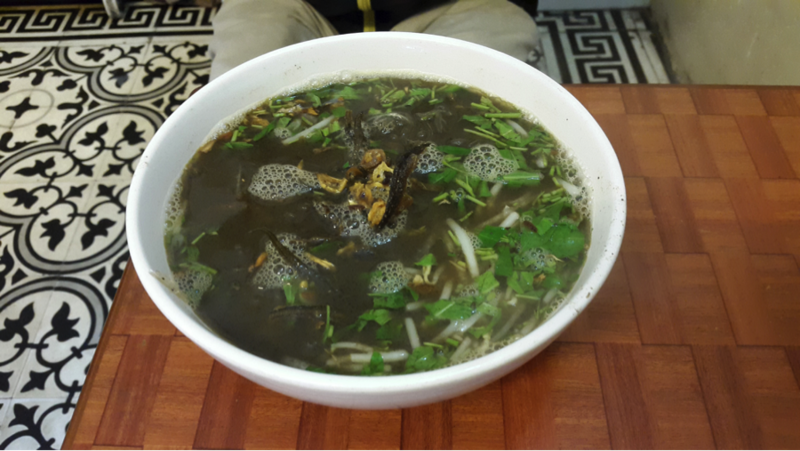 For the people of Hanoi, the most traditional way to begin our day is with a bowl of warm phở gà (chicken noodle soup) or phở bò (beef chicken noodle soup). We enjoy phở not only during breakfast but also during lunch and dinner because you can never say no to a bowl of fresh phở. 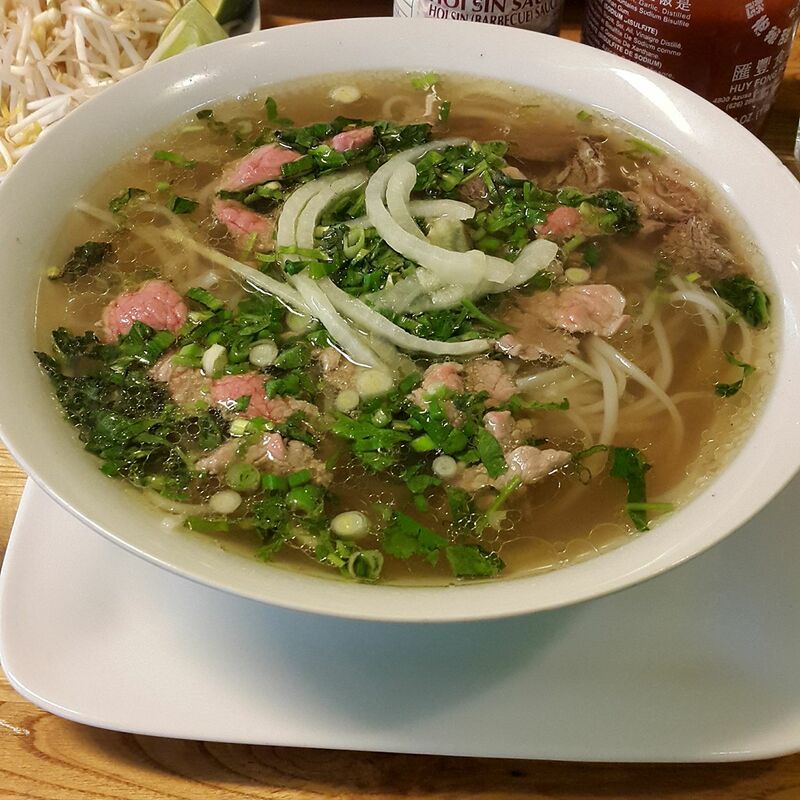 Phở is the Hanoian’s ultimate comfort food. The best thing about phở is that it is a natural hangover and cold/flu remedy. Another breakfast and lunch local favorite noodle soup is bún thang. 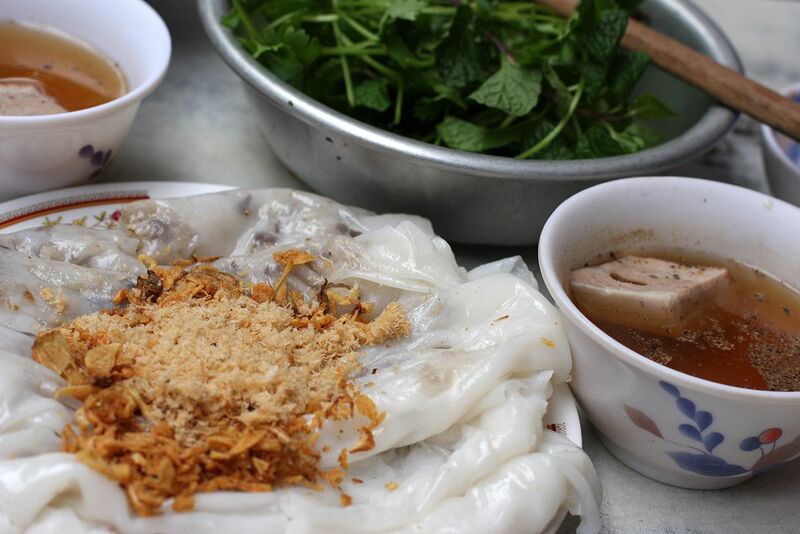 The rice noodles used in bún thang are thinner than the ones in phở. Bún thang usually consists of shredded chicken, thinly sliced omelet, giò (Vietnamese sausages), radish, mushrooms, and herbs. The overall flavor is quite delicate — for a stronger taste, some locals would add a teaspoon of mắm tôm (shrimp paste) into the broth. Bún thang is my aunt’s signature dish, which is usually made for me on my birthdays. Xôi (sticky rice) is a versatile ingredient in the Vietnamese cuisine. The sticky rice is made into both savory dishes and desserts. The most popular savory xôi dishes are xôi gà (chicken sticky rice), xôi xéo xôi ngô, and xôi thịt (sticky rice with caramelized pork). Locals tend to have savory xôi dishes in the mornings. Sticky rice desserts such as xôi chè (sticky rice and pudding) and xôi gấc are often made during special occasions such as Tết (Vietnamese New Year). If someone is ill, cháo (rice porridge) is the go-to food as it is easy to digest. Similar to xôi, cháo dishes are diverse. When I was a child, my mother used to cook cháo tía tô, which is made of rice, mince pork, carrots, and perilla. For me, it was the best remedy for any illness. A local favorite is cháo sườn (pork rib rice porridge), which is creamier and smoother than other cháo dishes. 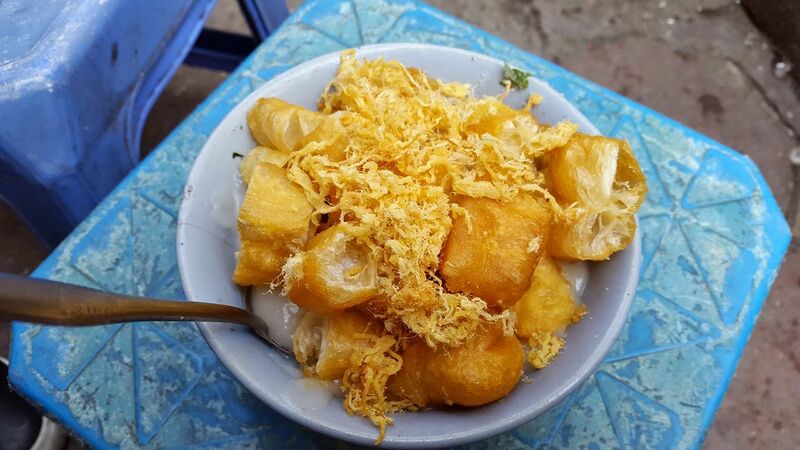 Cháo sườn is always served with quẩy (crunchy fried bread dough). Another variation of cháo is cháo trai (clam rice porridge). I used to eat bánh cuốn (steamed rice pancake) during the summer for breakfast because it is a cold and healthy dish. Bánh cuốn is a simple dish which consists of steamed rice pancake, chả (Vietnamese sausages), mộc nhĩ (ear mushrooms), fried shallots, herbs, and fish sauce. Despite its simplicity, bánh cuốn is difficult to make at home as it requires a special large pan and a set of skills. The thinner the pancakes are, the more delicious they are. Another cold dish which is perfect for lunch on a hot summer day is bún chả (vermicelli noodles with grilled pork). I remember when I was a child, my late grandmother would buy takeaway bún chả for me as a special treat. Bún chả as well as phở were our kinds of food – something we would always eat together. The flavorsome smoky barbeque pork of bún chả is definitely the best part of the dish. Accompanying the pork is a bowl of cold vermicelli noddles, herb, and sweet and sour fish sauce. The Vietnamese noodles are like Italian pasta, which come in all sorts of shapes and variations. Apart from bánh phở (rice noodles used to make phở), bún (vermicelli noodles), mì (egg noodles), and bánh đa (large noodles), there is also miến (cellophane noodles), which are transparent. 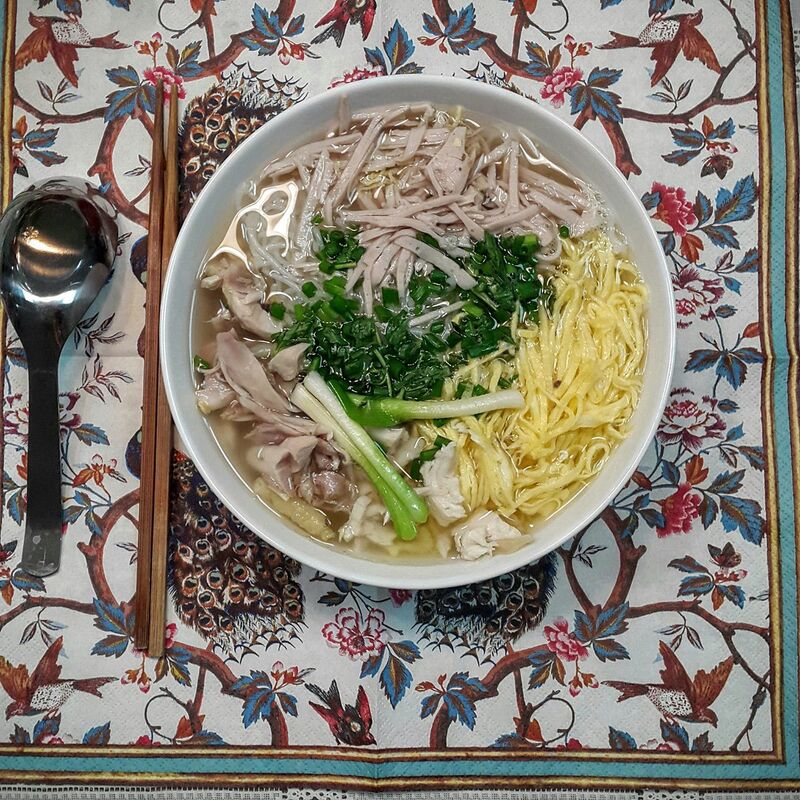 Miến is often made into noodle soups, and my all-time favorites are miến gà (chicken cellophane noodle soup) and miến lươn (eel noodle soup). My mother’s signature dish is miến gà, though we usually go out to eat miến lươn because it is quite complicated to make. 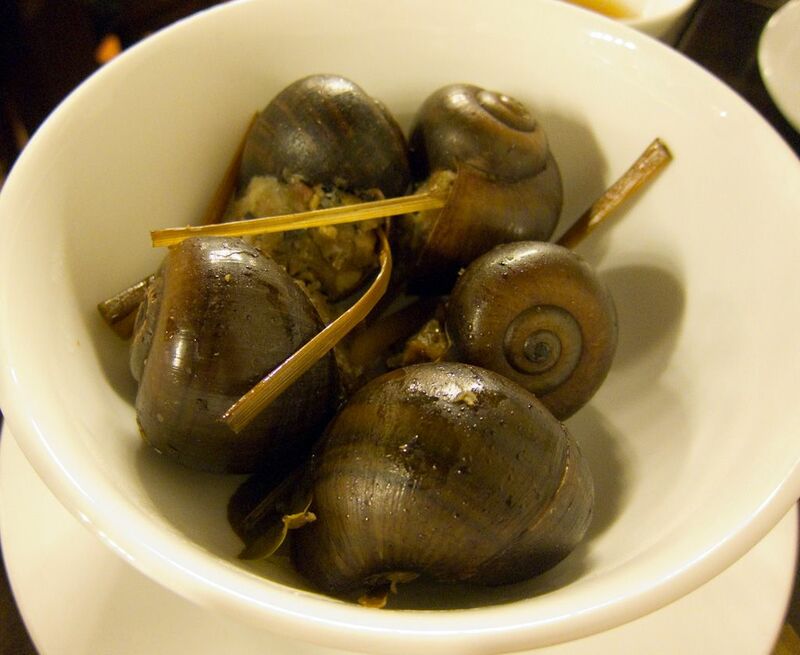 The French have snails, the Vietnamese have ốc (sea snails). Vietnamese sea snails are often served on their own or dipped in a light, sweet and sour fish sauce. They are chewier and much more flavorful than the French snails. I remember suffering from indigestion for eating too many snails but they are hard to resist. 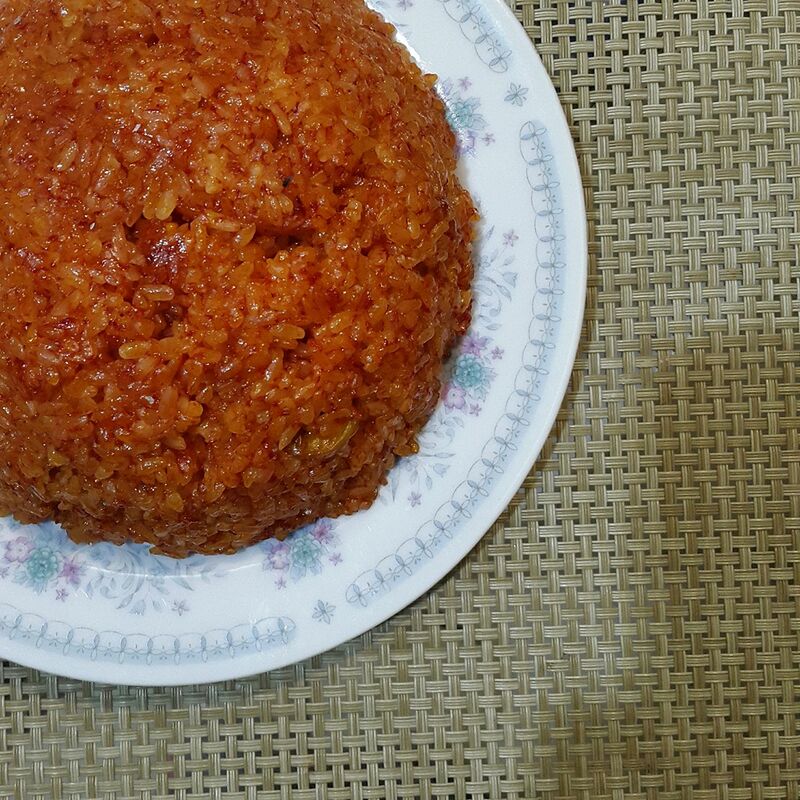 A dish of ốc is considered snacks rather than a meal. Phở cuốn (pho rolls) look like gỏi cuốn (spring rolls) but they are different. The wrap of phở cuốn is made from rice and is the larger version of bánh phở (rice noodles) found in the dish phở. Inside phở cuốn are usually cooked beef, lettuce, and a variety of herbs such as mint. On a hot summer day, Phở cuốn is an ideal snack or light meal. Every single food in the list is a must try, but if you can only eat one thing – something that is difficult to find outside of Hanoi – then I would highly recommend bún chả cá, my all-time favorite dish. The dish is simple yet delicate and unique. After being seasoned and marinated in turmeric, fresh pieces of white fish are stir fried on a hot pan, traditionally placed on flaming coal. Then the fish is paired with dills, spring onions, bún (vermicelli noodles), peanuts, herbs, and dried shallots. All in one mouthful with a dollop of shrimp paste. Heaven! 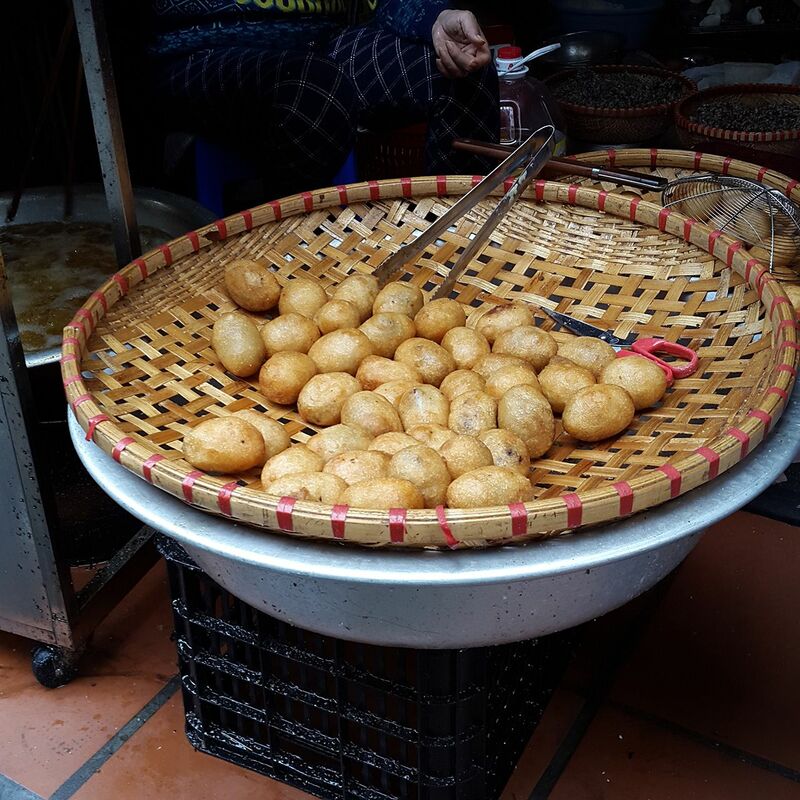 My favorite street food is bánh rán (fried balls), which are made from sticky rice and a variety of fillings. Inside the fried dough can be either savory or sweet, but I prefer the sweet filling with mung bean paste. The savory filling often contains mince pork and mushrooms. The most appealing thing about bánh rán is the golden brown outer layer – crispy on the outside and chewy on the inside. Kem cốm (young rice ice cream) and kem đậu xanh (mung bean ice cream) are signature flavors of the long-standing store Kem Tràng Tiền. These delicacies are sold on Tràng Tiền Street, one of the most visited streets in central Hanoi, hence the name kem Tràng Tiền. One of my favorite childhood street foods was bò bía ngọt, which I do not even know to translate into English. It is a sweet dish containing a type of Vietnamese sweet (tastes like honey or golden syrup), dried coconut, black sesame seeds – all wrapped in flour pancakes. My brother used to buy them for me after school, and each time he did that, I would think that he was the best brother in the world because bò bía ngọt was really tasty. The most traditional food during the Vietnamese New Year in the North of Vietnam is bánh chưng (sticky rice cake). 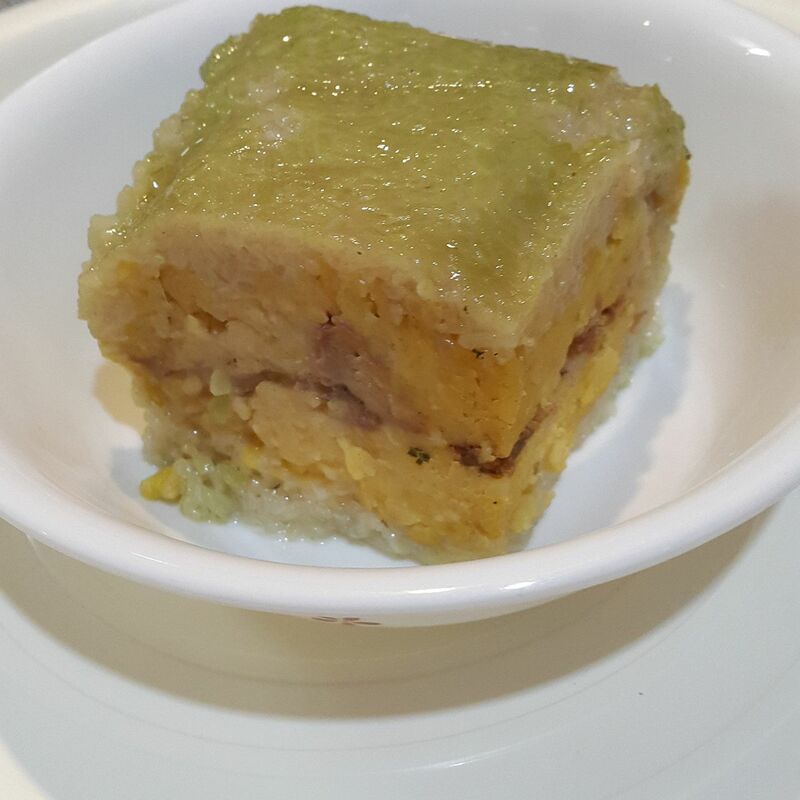 The square cake consists of sticky rice, mung bean paste, and pork. It is cooked over a low fire for long hours (traditionally overnight). The green color and square shape of the cake represents the Earth in the Vietnamese culture. 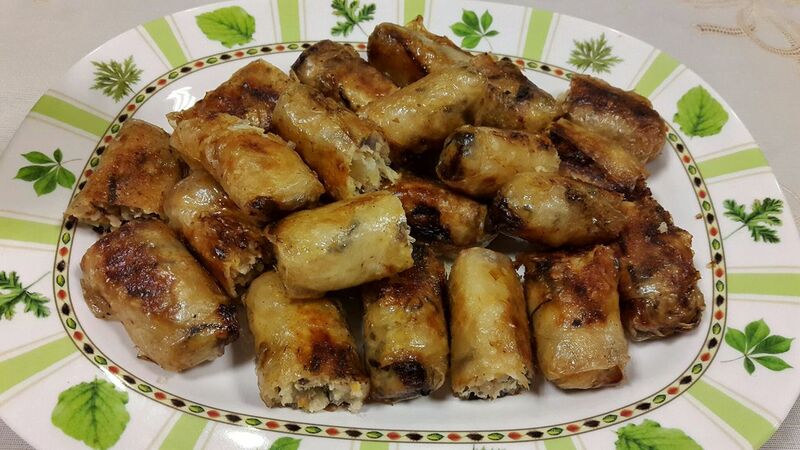 Another must-have dish during the Vietnamese New Year is nem rán (fried spring rolls). Usually, the whole family would help to make this dish because it is time-consuming and requires some techniques. Since I was a child, I was taught how to make them. After mixing minced pork, some vegetables, eggs, noodles, mushrooms together, you have to roll and cover them in rice papers, which are very thin. The rolls are deep-fried until golden brown. They are the best food for family sharing. Many traditional Vietnamese desserts are made from rice and so are bánh trôi bánh chay (sweet rice balls). Bánh trôi and bánh chay are two types of sticky rice balls which are often made together from the same dough. Bánh trôi is smaller than bánh chay, and its filling is brown sugar. Bánh chay’s filling is mung bean paste and is served as a pudding. In Huế, the old capital of Vietnam, bún bò Huế (Hue beef noodles) is the most popular noodle dish. 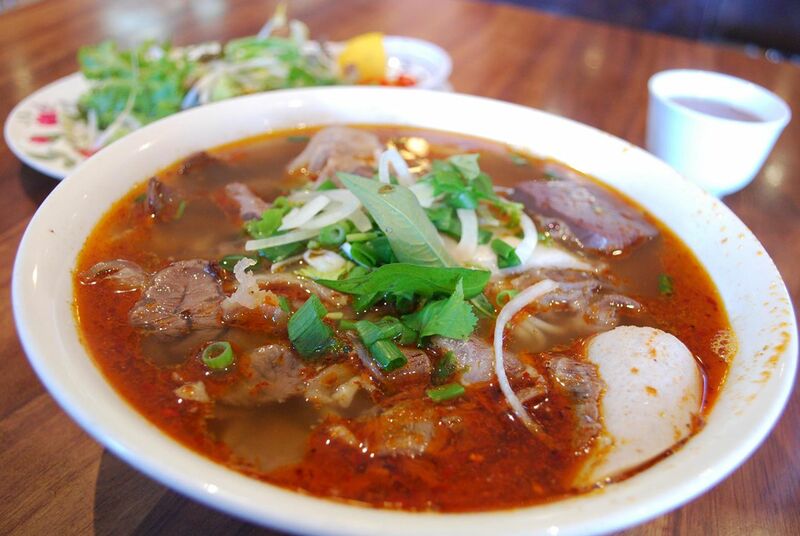 As my late grandfather was from Huế, I used to visit the city and eat bún bò Huế all the time. The dish is meaty, spicy, and flavorful, especially delicious on a rainy cold day. The noodles are thicker than those from other cities. Once in Huế, never miss a selection of bánh Huế (Hue pancakes). The pancakes are always made of rice. The most popular filling is shrimp. They can be served as both appetizers and main dishes. 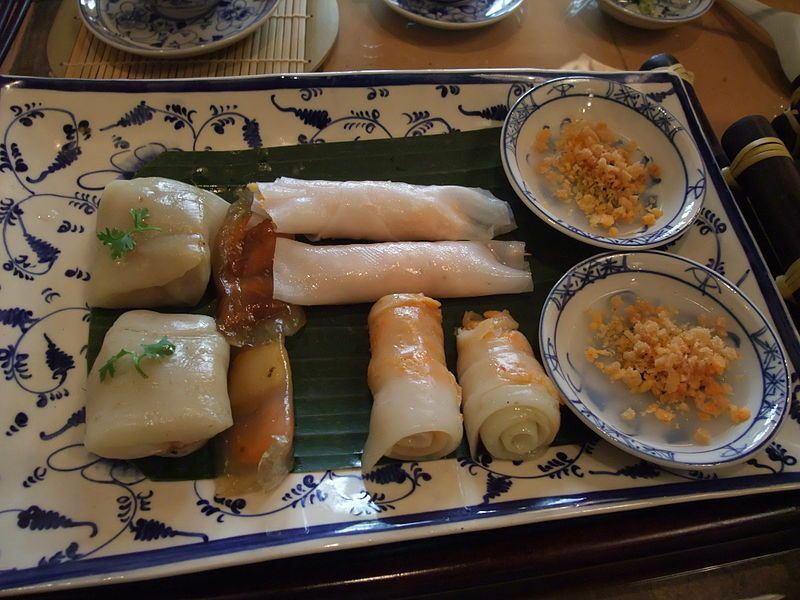 Another delicacy from Huế is chạo tôm, which is originated from the royal kitchen when Huế used to be Vietnam’s capital. The dish consists of mince prawns wrapped around sugar cane sticks. Chạo tôm is fried until golden brown, and sometimes served with vermicelli noodles. The best way to keep cool in the summer is to have a bowl or two of chè (Vietnamese pudding). Chè is made of a variety of ingredients such as beans, fruit, coconut milk, and jelly. Chè sương sa hạt lựu, chè bưởi (grapefruit pudding), and chè thập cẩm (assorted pudding), are among the most beloved ones. Huế is most famous for its traditional chè recipes. 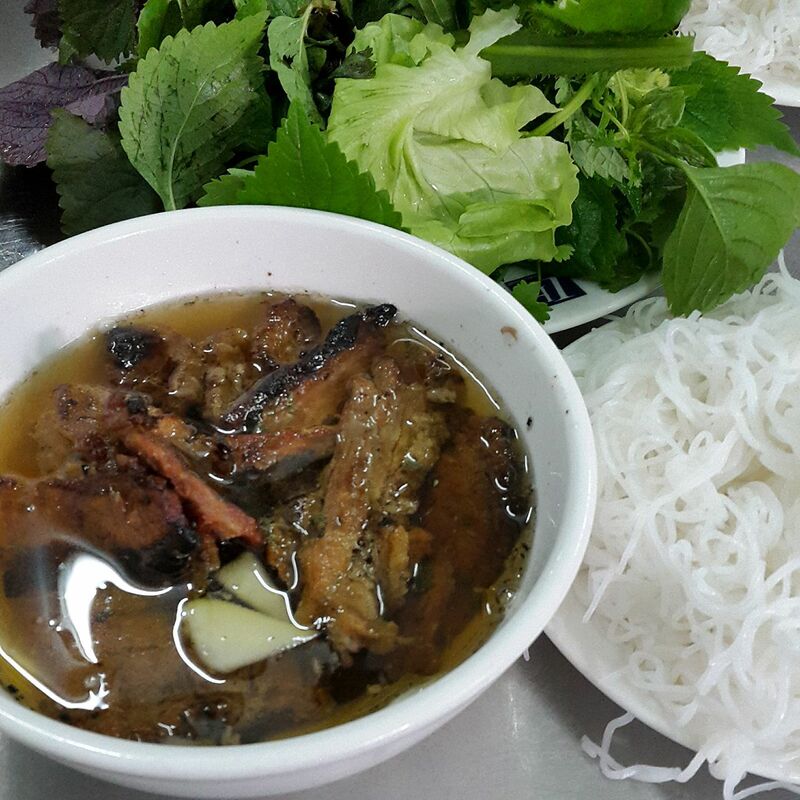 A beloved noodle dish in Ho Chi Minh City in the South of Vietnam is hủ tiếu Nam Vang. The dish consists of many ingredients including mince pork, shrimps, livers, eggs, and so on. It can be either served in a broth or as a dry noodle dish, to which is added soy sauce and fried shallots. Another popular noodle dish is hủ tiếu cá (fish noodles). This dish is particularly light as it is made from fresh white fish. The broth is clear and delicately flavored. The noodles are flat and a bit larger than the average noodles. 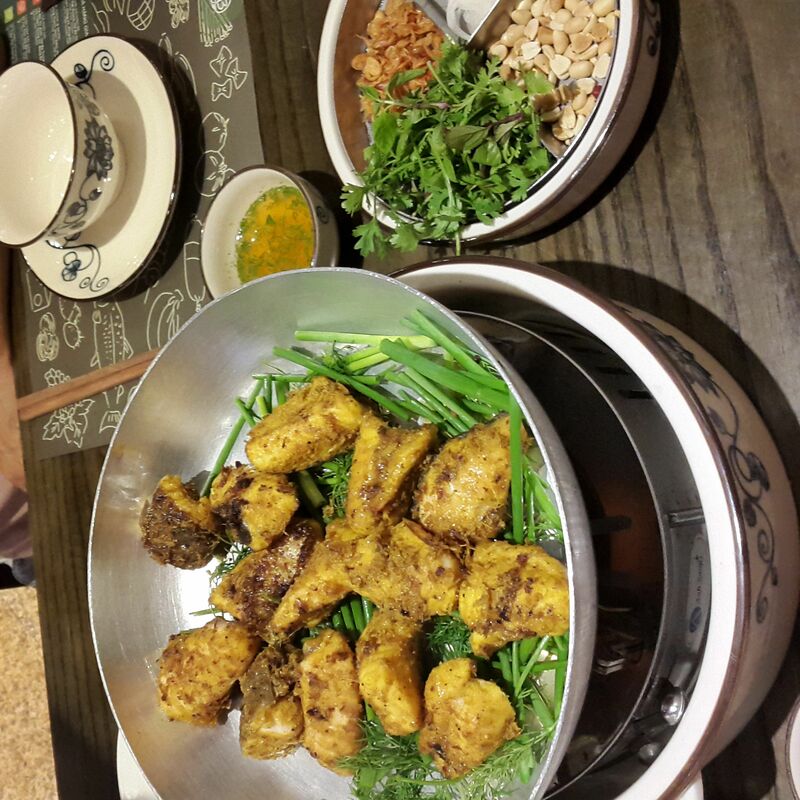 This combo rice dish, famous in Ho Chi Minh city, comes with a lot of tasty side dishes. The best part of cơm tấm sườn nướng (broken rice with grilled pork) is the grilled honey-glazed pork chop. The dish is also served with steamed eggs, bì chả, and a bowl of soup. The rice in this dish is called broken because they used to be served to the poor. However, it is now enjoyed by everyone — regardless of their budget.